Robert Pattinson Mission: Blacklist movie: Filming in August? Mission: Blacklist is not the upcoming fifth installment in the Mission: Impossible franchise starring Tom Cruise. For the time being, that's concisely called Mission: Impossible 5. So, what's Mission: Blacklist? Well, as every ardent Robert Pattinson fan will tell you, that's a Pattinson movie project initially announced in early May 2012. Pattinson is attached to this Embankment Films-financed (or to-be-financed) production based on Eric Maddox and Davin Seay's book Mission: Black List #1 - The Inside Story of the Search for Saddam Hussein - As Told by the Soldier Who Masterminded His Capture. Unlike other Interrogators fresh out of training, Eric Maddox (Robert Pattinson) has a brilliant and beautiful mind. He has a unique ability to decipher highly complex patterns from seemingly random events. Mission: Blacklist filmmakers: Jean-Stéphane Sauvaire unlisted? The listed Mission: Blacklist producers are Ross M. Dinerstein, Kevin Waller, Al Corley, and Bart Rosenblatt. Jonathan Dana and Eugene Musso are the movie's executive producers. According to Embankment Films, the Mission: Blacklist production status is as follows: Pre-production in summer 2013; shooting in late summer 2013; ready for release in summer 2014. Needless to say, “ready for release” or “delivery” doesn't mean that Mission: Blacklist will come out in summer 2014; it just means it'll be ready then – in case any distributors are interested. Not long ago, an August filming date for Mission: Blacklist was announced on a local Oklahoma newscast following an interview with Eric Maddox, who, by the way, asserts he never used torture while working as an interrogator for the U.S. military. Also of note, Maddox is a devout Christian – “My faith plays an absolute role in every single thing I do” – who has said he doesn't “believe in vampire movies and stories” and “just didn't know” who Robert Pattinson was prior to Pattinson's involvement on Mission: Blacklist. Back to Mission: Blacklist's purported filming date: If shooting will commence in August, how can Werner Herzog's Queen of the Desert, in which Robert Pattinson is to star opposite Naomi Watts and James Franco, start shooting in Morocco in September? Division Films, a Queen of the Desert co-producing entity, tweeted about the September filming date a few weeks ago. Queen of the Desert initially had a late 2012 shooting schedule, later postponed to March 2013. In this Gertrude Bell biopic, Pattinson is to play T.E. Lawrence a.k.a. Lawrence of Arabia. And that's not all. David Cronenberg's Maps to the Stars, to feature Robert Pattinson, Julianne Moore, John Cusack, Mia Wasikowska, Olivia Williams, Sarah Gadon, and Evan Bird is to begin filming in July in Los Angeles and Toronto. In sum, some dramatic rearranging of shooting schedules will have to be effected. Else, Pattinson will in all probability have to drop out of at least one of those projects. In case all the Embankment Films projects pan out, the newly founded indie financing company will be quite busy this summer. Besides Robert Pattinson's Mission: Blacklist, other Embankment projects due to start pre-production in the coming summer months are The Kidnapping of Freddy Heineken, to star Anthony Hopkins and to be directed by Daniel Alfredson; Pressure, with Ron Scalpello at the helm; Sleeping Dogs, to be directed by Erica Beeney; and Birdsong, to star Nicholas Hoult under the direction of Rupert Wyatt. Also announced last year, at the same time as Mission: Blacklist, was another Robert Pattinson movie project, The Rover. Directed by Animal Kingdom's David Michôd and co-starring Guy Pearce, The Rover was shot in Australia earlier this year. The film has no official release date as yet, though a late 2013 launch is a possibility. Robert Pattinson was seen in three 2012 releases: Nick Ormerod and Declan Donnellan's Bel Ami, which had been actually shot in 2010; David Cronenberg's Cosmopolis, which received mixed notices in the U.S. – though Pattinson himself was not infrequently singled out for praise; and Bill Condon's The Twilight Saga: Breaking Dawn - Part 2, the last installment in the Twilight franchise co-starring Kristen Stewart and Taylor Lautner. Mission: Blacklist poster featuring Robert Pattinson's eyes: Embankment Films. Eric Maddox quotes re: Robert Pattinson, his Christianity: OUDaily.com. Mission: Blacklist / Robert Pattinson fansites and Twitter accounts: @blacklist_blog, mapstothestars-film.com, missionblacklistfilm.com. Robert Pattinson in The Rover with Guy Pearce. 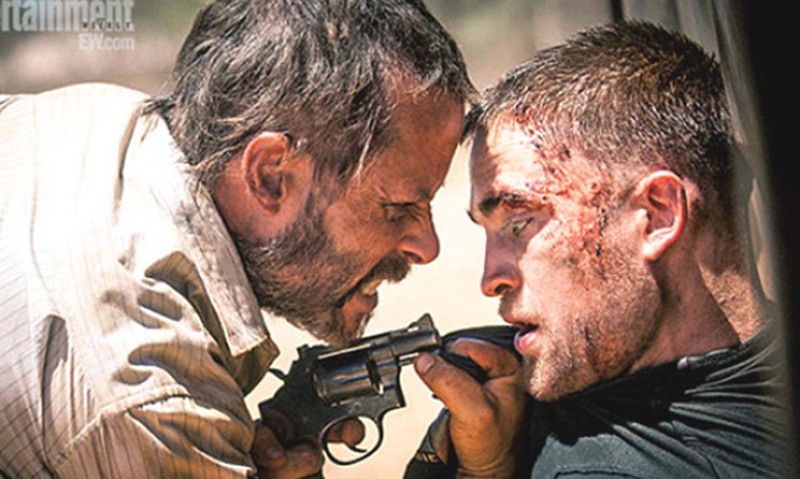 Currently filming in Australia and set in the near future following worldwide financial collapse (unclear if caused by the recent controversial Cyprus bailout non-deal), The Rover features Robert Pattinson as a kind-hearted Australian Outback gang member. Guy Pearce, who had previously roamed the Australian Outback in high heels and outlandish costumes as one of the flaming drag queens in The Adventures of Priscilla, Queen of the Desert, plays a man who goes off the deep end after Pattinson's gang steals his car. Michôd adds that, in regard to another thriller involving gangs, cars, and the Australian Outback, George Miller / Mel Gibson's trash classic Mad Max, “I think The Rover is going to be way more chillingly authentic and menacing.” Well, if the Robert Pattinson / Guy Pearce picture above is any indication, Michôd may have a point. Based on a story by Michôd and Joel Edgerton (soon to be seen opposite Leonardo DiCaprio and Carey Mulligan in The Great Gatsby), besides Robert Pattinson and Guy Pearce The Rover features Killing Them Softly's Scoot McNairy as Pattinson's brother, Nash Edgerton (Joel's brother), Samuel F. Lee, Anthony Hayes, and David Field. If all goes well, next for Robert Pattinson are Jean-Stéphane Sauvaire's anti-Zero Dark Thirty-ish (as in, no torture) Hunt for Saddam Hussein drama Mission: Blacklist; James Marsh's thriller Hold on to Me, opposite Carey Mulligan; Werner Herzog's Queen of the Desert, in which Pattinson is to play T.E. Lawrence (Peter O'Toole in David Lean's Lawrence of Arabia), opposite Naomi Watts and Jude Law; and another David Cronenberg effort, Maps to the Stars, which was to have co-starred Viggo Mortensen and Rachel Weisz, though things seem to be up in the air now. For the record, Robert Pattinson's five appearances as the likable – if way underused – Edward Cullen were in Catherine Hardwicke's Twilight, Chris Weitz's New Moon, David Slade's Eclipse, and Bill Condon's Breaking Dawn - Part 1 and Breaking Dawn - Part 2. The Rover Robert Pattinson, Guy Pearce image: Matt Nettheim / Porchlight Films / Lava Bear Films / Screen Australia, via EW.com. Not sure how Queen of the Desert can be filming in fall when Watts has another movie that is going to start in the fall. And Franco isn't confirmed for Queen of the Desert and also appears to have attached to a Wim Wenders movie that starts sometime in August which probably means filming starts in Sept. So really, the only movie that is slated to go is Maps to the Stars which isn't anything to sneeze at. Weird story but good cast and it is the type of thing that Cronenberg is good at so if Pattinson only does The Rover and Maps, that's not bad. I really am looking forward to seeing this story told. I think Rob Pattinson is a wonderful choice to play Eric Maddox, he has demonstrated an ability to become the character he is portraying in a way I have never seen before. He is a fine actor. So so proud of Rob and all of his movies coming out! :) I'm most excited for Mission:Blacklist! Of course US theater owners were disappointed with the Remember Me box office, but it's not their fault the US wasn't ready to deal with 9/11. You'll remember that despite 10 times the advertising and promotion, Extremely Loud and Incredibly Close was a flop. No matter what formula you use, it didn't make a profit. The international success of Remember Me just highlights that Pattinson is popular worldwide, he isn't one of those actors with only a US following. And worldwide, they were much more willing to watch a film with a tough ending and that included 9/11. They've been dealing with terrorism a lot longer than the US. And RM really got very little advertising or promo in the US, so they didn't blow the budget on that. They knew it would have a limited appeal, it didn't have a happy ending, and everyone knows those kinds of films are not going to draw a massive audience. Still, I think Pattinson is making smart choices for a long lasting career as an actor, not a movie star. It seems Rob is the only actor that reviews and box office numbers of his movies are scrutinize in every possible way and they are bring up in every article related to him.He doesn't distance himself from Edward he just plays various roles,because he is an actor.Once again author of this article is trying to make a drama.I would love to read box office of J.Franco movies outside of Oz,and also Rachel Weisz's,or M.Williams',all of them are Oscar nomenee/winners. “Rob” (is he your buddy?) isn't the only film personality “that reviews and box office numbers of his movies are scrutinize [sic] in every possible way” etc. etc. See, for us box office data is something called “information,” not “drama.” That's why box-office figures are often mentioned when we have that sort of information available. You're wrong about WFE being the only profitable movie. Remember Me made a profit, if you use the 3x the budget formula. The budget was $16 million and it made $56,032,889 worldwide. Not a smash hit, but it did make a profit, which is what counts, especially considering so many New Yorkers couldn't deal with the ending. So two of Pattinson's indie films outside the Twi franchise have made money, something none of his other co-stars can claim. You are also right about him being likable if underused (we can actually be happy about that) in the Twilight franchise. He's said himself that it will take about 10 years for people to forget about Twilight, but with the line up of films he'll have coming out in the next couple of years, hopefully the Twi amnesia will happen sooner rather than later for Pattinson. I'm not sure if the Robert Pattinson-Reese Witherspoon movie “Water for Elephants” was “profitable” at the box office. It may have broken even. But again, $117m is a “respectable” sum, as mentioned in the article. Either way, the film surely ended up in the black once ancillary revenues were tallied. The same goes for “Remember Me,” though, again, I find it doubtful that the $16m film (plus another $6-$10m? in marketing / distribution costs; possibly some box-office-gross sharing arrangement?) “made a profit” at the box office alone. The “3x budget formula” is quite iffy, especially in a case when most of the film's box-office revenues came from outside North America as the studios/producing companies get a considerably lower percentage of international box-office grosses (as a rule of thumb, 40% vs. 50-55% domestic). But irrespective of the “Remember Me” contractual arrangements with distributors / exhibitors outside the U.S., $19m in North America for a 2010 romantic melodrama starring Robert Pattinson surely left at least U.S. distributor Summit disappointed.